In 2017 we surveyed the leaders of 145 nonprofit organizations. Nearly 80 percent reported that their organizations aspire to innovate. And the majority reported that innovation is critical for their organizations, for a variety of reasons. Almost 60 percent need to identify new funding streams. Almost 40 percent need to adapt to changing political or regulatory environments. And more than half believe that without effective innovation, they simply won’t be able to achieve the impact they seek. Unfortunately, only 40 percent of our survey respondents believe that their organizations have met their aspirations for innovation, or that their organizations are set up to innovate successfully. 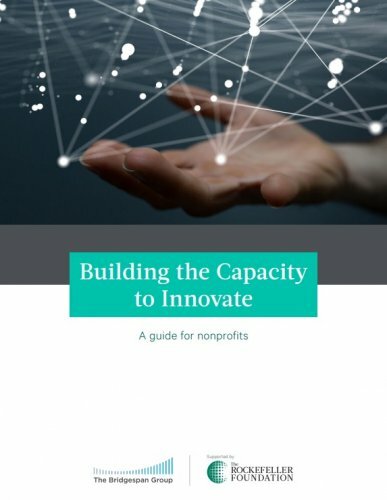 The purpose of this guide is to help nonprofits close the gap between their aspirations and their current capacity to innovate. It is meant to help nonprofits build the mind-set and the muscles needed to identify breakthrough ideas, opportunities, and ways of working—and put them into practice. This guide is for anyone who wants to learn more about what it takes to build an innovative organization. It is for restless leaders and staff at all levels of social sector organizations who want to help achieve breakthroughs, and who are frustrated with the lack of new ideas or the inability to move new ideas forward from concept to implementation. It is for those who recognize the value of building an innovative organization and who want to move from aspiration to action. This guide is also for funders and board members, including those who believe in the power of innovation already and those who might be more skeptical. Our hope is that this guide makes abstract concepts more concrete and actionable, and that it provides social sector professionals greater clarity about the steps they can take to help build more innovative organizations.